While the Money in the Bank card still sits at 10 matches coming out of this week's television, one of those has been moved to the pre-show. 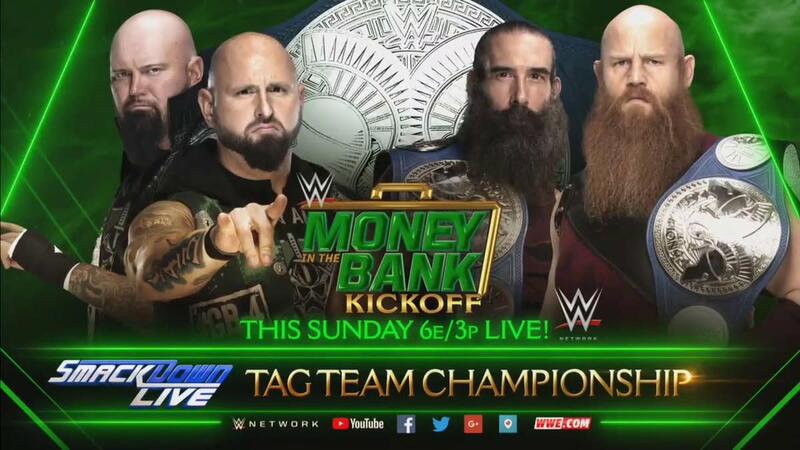 WWE announced on Tuesday night that SmackDown Tag Team Champions The Bludgeon Brothers' title defense against Luke Gallows & Karl Anderson is now set to take place prior to Sunday's main card. Gallows & Anderson defeated The Usos in a number one contender's match on the May 22nd episode of SmackDown to become Harper & Rowan's next challengers. The B-Team (Curtis Axel & Bo Dallas) also won a number one contender's battle royal in the lead-up to Money in the Bank for a shot at Raw Tag Team Champions Matt Hardy & Bray Wyatt, but WWE hasn't announced when that match will be taking place. Money in the Bank is the first show affected by WWE's start-time change for pay-per-views. The pre-show will begin at 6 p.m. Eastern time on Sunday, with the main card starting at 7 p.m. and listed as ending at 10:30 p.m.